For the last seven years, Martin Stupich has explored, researched, and photographed the Red Desert. 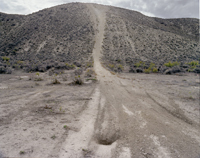 His images convey this region's expansive landscape, diverse geology, evidence of the earliest human occupation, boom and bust towns, and present day industry. The Red Desert is a 15,000 square mile basin in southern Wyoming that straddles the Continental Divide and stretches across what is known today as the I-80 corridor. The largest unfenced expanse in the lower 48 states, many who travel the route between Rawlins and Rock Springs view the barren, high-desert landscape as a featureless, "empty" place with little if any redeeming value. However, the Red Desert is a spectacularly complex place with delicate microclimates and fragile ecosystems, dramatic geology that offer evidence of its origins and life over eons of time, a home to wild horses and desert elk, unique flora and fauna, and, for several thousand years, human beings. 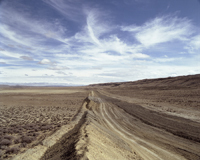 Throughout its life, the region has endured all that nature and man have given it: droughts and floods, the ebb and flow of energy booms, settlements, and a myriad of bisecting and transecting overland routes that include the earliest pioneer trails and the first transcontinental railroad. Today, it is almost exclusively Bureau of Land Management lands with National Forests, National Wilderness Study Areas, and National Recreation Lands. Beneath the Red Desert's expansive and sparse landscape lie mineral reserves and one of the largest known natural gas reserves. In an era of increased energy demands and with a national polocy in flux, this is an uncommon time in the life of the desert. Over the last two decades, mineral extraction has accelerated dramatically, and more recently, the tapping of natural gas reserves is transforming the Red Desert from a place of wilderness to one of commodity at an unprecedented pace. Since 2000, Stupich has photographed the Red Desert with an urgency to record it in the midst of its changing. His images portray a complicated and fragmented portrait of this place and a human history connected to it. It is a portrait that encourages us to look again and consider the Red Desert in all its wonder and wildness. Funded in part by Richard and Judith Agee, the Guthrie Family Foundation, the National Advisory Board of the UW Art Museum, and the Wyoming Arts Council through the Wyoming State Legislature and the National Endowment for the Arts which believes a great nation deserves great art.